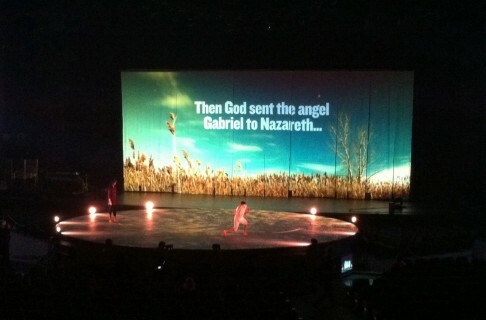 Willow’s Christmas service for 2010 incorporated 2 different projections surfaces into the set design. A traditional vertical projection screen 48′ wide by 24′ tall and a circle shaped stage 36′ diameter used as a projection surface. The main challenges with the project were the projection angles and alignment. The vertical screen at the rear of the stage was apx. 80 to 90′ away from the projectors, which were up in the catwalks making for a steep projection angle (off axis) to the screen. What I mean by off axis is that the bottom of the video wall is further away from the projectors than the top, creating an image that was severely keystoned. To get the image to fit correctly to the surface it has to be mapped or warped. I used Pandora’s Box Pro media server to supply the HD video content and “warp’ the image to fit the projection surfaces exactly. The projectors I used for the vertical wall were Barco FLM HD 20K’s. I used two 20k’s double stacked to get a bright enough image. They were precisely aligned with Pandora’s warp feature and no edge blending was necessary. We used 1.5-2.0 lenses to achieve the correct projection throw. The circle stage was 36′ in diameter, projectors were hung from above this stage & project straight down onto the stage surface. 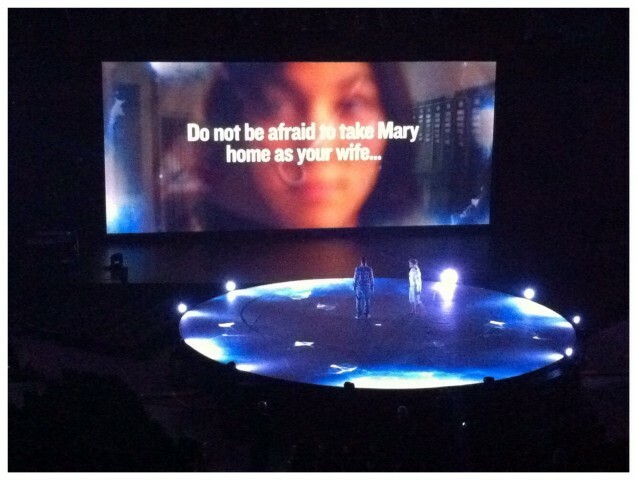 The biggest challenge of getting a nice bright image on the stage was a short projection throw distance. In order to get the image bright enough I used 2 Barco FLM R22k’s with fixed .8 lenses. I was concerned that the .8 lens was too wide and dim but it worked. The combined projectors were bright enough even with dark content. The projectors were hung directly over the center of the circle stage oriented straight down. A side note, I originally spec’d HD projection so that I could benefit from more pixels. However, I then learned that I would not be using almost 50% of the image and lamp brightness due to the shape of the stage versus the native projector resolution. Knowing this, I decided to go with the R22’s because its 1400×1050 resolution. I gained brightness and only lost 25% of the image. I also used a Pandora’s Box Pro media server to converge and provide video content to the projectors. I also used one additional Pandora’s Box Pro media server to provide SD content back into our in house video system. All of the the media servers are run by Pandora’s Box Media Manager which is a separate computer that controls or triggers the servers.